It is a well-documented fact that we are now sitting on a demographic time bomb. With ever increasing property prices and first time buyers unable to secure a mortgage, people aged between 20-34 are now having to move back into the family home to live with their parents in order to save up for a deposit on a property or because they simply cannot afford anywhere else to rent. And at the other end of the age spectrum, elderly relatives are moving into their children’s homes as they don’t fancy the options available to them e.g. care home, at home care or a retirement village etc. And state social care is pretty non-existent too. So inter-generational living is, and will become ever more so, perhaps the only viable solution. But we all value our own space and independence whatever your age and without doubt everyone cohabitating under the same roof – with different needs and wants – will apply undue pressure to the stress buttons shall we say! accommodation to the main house. But these buildings can also be used by the afore-mentioned “boomerang” generation. And don’t forget the other strong trend of renting out a spare room on popular platforms such as AirBnB. 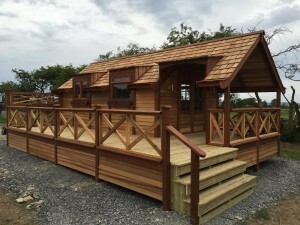 In the majority of cases, planning permission will need to be granted for these type of buildings but due to the fact that the granny annexes from the Hideout House Company are built to conform to the legal definition of a mobile home or caravan (based on their size, mobility and construction method), in the majority of cases planning permission will not be required. However we do recommend that you (or we on your behalf) obtain a Certificate of Lawful Development for peace of mind. Essentially this is similar to planning but you don’t have to submit plans and it confirms that the building is a permitted development by your local planning authority. You should be able to get this form and/or apply online from the planning portal website. 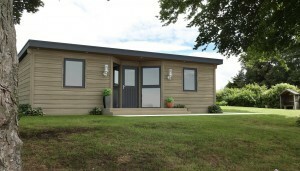 And there are some other useful advantages to be had – namely these granny annexes do not require building regulation approvals and VAT is only chargeable on soft furnishings and not on the building itself. As it is “mobile”, the building can easily be moved at a later date if you have to move house or simply want to sell it on.